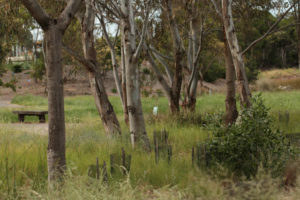 Bill Landcare – Westgate Park (formerly Friends of Westgate Park) in the Fishermans Bend area of Port Melbourne. The main entry is in Todd Road, just north of Westgate Bridge. Other entries are at end Lorimer Street alongside the Yarra River and at the end of Wharf Road. Bus 237 from Queen Victoria Market/Franklin Street or Southern Cross station to end of Lorimer Street (every 20/30 minutes week days only). Tram 109 in Collins St to Station Pier and a longish walk along the foreshore towards the River and up Todd Road just past the Westgate bridge. 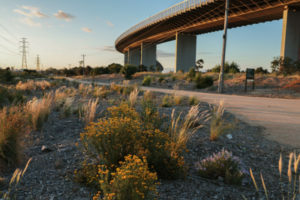 It’s a great bike ride either from the City along South Wharf and Lorimer Street or from around the Bay through Port Melbourne and up Todd Road to the main entry. We work Monday to Wednesday 8.30am-4pm and the 3rd Sunday of the month anytime. Bus 235 from Queen Victoria Market/Franklin Street or Southern Cross station to cnr Williamstown Road & Raglan Street, Port Melbourne. 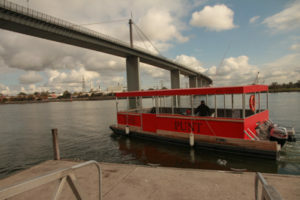 The nursery is between the Port Melbourne Football oval and Australia Post Business Hub. In due course we expect to be consolidated at Westgate Park in a purpose-built compound, community space and nursery.